Renewable Heating and Cooling Sources are Biomass, Geothermal, and Solar Thermal, Air, and Water. These sources are often used with heat pumps to provide renewable heating and cooling to homes, businesses and industry. Biomass is the first energy source that humankind started to control. 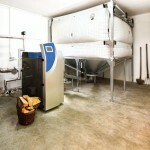 Today, in Europe, biomass is mainly used to heat households and, additionally, to provide hot water. 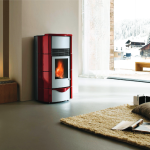 A stove burns logs or pellets to heat a single room. A boiler can provide heating and hot water. A boiler burns logs, pellets or chips, and is connected to a central heating and hot water system. Biomass heating systems can often integrate into existing heating systems, or replace them, and fulfill all of the heating needs of a home. Biomass has the advantage of being controllable and available when needed, similar to fossil fuel heating. The disadvantage of biomass for facility heating is that the fuel needs to be purchased and stored. A low-carbon option through substituting fossil fuels: The use of biomass in heating can replace oil, gas or coal. Biomass is considered to have a zero balance concerning carbon dioxide emission, since when wood is burned the amount of carbon dioxide emitted corresponds to the same amount that was absorbed over the period that the plant was growing and will be absorbed again when the plant starts growing again. The carbon emissions caused by the cultivation, manufacture and transportation of the fuel, especially when the fuel is sourced, are much lower than the emissions from fossil fuels. Also, the process is sustainable as long as the biomass used for fuel is regenerated. Operational fuel cost savings: The costs of biomass fuels can be much lower than the fossil fuel being displaced and biomass heating systems can therefore provide attractive operational cost savings both for households and industries. Reduced fuel price volatility: Security of energy supply is a recurrent concern for fossil fuels due to geopolitical instabilities which can lead to unexpected price changes. While biomass fuels are subject to changes in price over time, these are less extreme and independent from geopolitical circumstances as the biomass is sourced locally or from stable regions. A source of economic development and job creation: Biomass used for heating, can stimulate local economy and create jobs by driving fuel supply in agriculture, forestry, logistics, installation and maintenance activities and give value to local resources that were not mobilized and used before. Geothermal energy is the heat from below the earth, which is extracted through boreholes. Geothermal heating & cooling can supply energy at different temperatures (up to 250°C, usually for industry), at different loads, and for different demands. Currently, geothermal energy sources provide more than the equivalent of 4 million tonnes oil (Mtoe) per year for heating and cooling in the European Union, equivalent to more than 15 GWth installed capacity. Following current trends, in the European Union (EU-28), the contribution in 2020 will amount to around 40 GWth installed, corresponding to about 10 Mtoe. Shallow systems typically use heat at depths of up to 400m coupled heat pumps to provide heating and cooling. Thermal energy can also be stored at these depths. Shallow geothermal energy is the most commonly used in Europe, with installations almost everywhere. 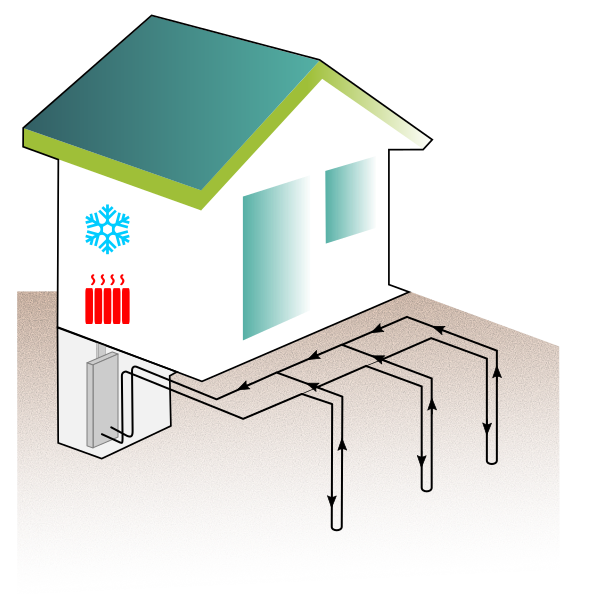 Two techniques exist for the use of shallow geothermal energy. Open loop systems extract groundwater, reinjecting it after the thermal energy has been used. Closed loop systems use a closed circuit underground. Closed loop systems can either be Horizontal closed loop, buried at 1-10m (more information at thermomap-project.eu), or Vertical loop, also known as a borehole heat exchanger- these can reach depths of hundreds of metres. More information about shallow geothermal energy can be found at regeocites.eu. There are about 250 Geothermal District Heating systems in Europe, providing thermal energy to all sectors of the economy. This sector is set to grow, with a further 210 systems under development or evaluation in Europe.The short video from the GeoDH project (www.geodh.eu) gives a brief overview of how Geothermal District heating works. There are also a number of direct uses for Geothermal energy. It is used for desalination, in agriculture, for snow melting and de-icing, and in balneology. More information can be found here (pdf). The basic principle common to all solar thermal systems is simple: heat from solar radiation is conveyed to a transfer medium – usually a fluid but also air in the case of air collectors. The heated medium is used either directly or indirectly, by means of a heat exchanger which transfers the heat to its final destination. Solar thermal can be used in a wide variety of applications, including domestic water heating, space heating, district heating, process heat generation for industry, etc. Thermosiphon (or natural flow) systems: Thermosiphon systems use gravity to circulate the heat transfer medium (usually water) between collector and tank. The medium is heated in the collector, rises to the top of the tank and cools down, then flows back to the bottom of the collector. Domestic hot water is taken either directly from the tank, or indirectly through a heat exchanger in the tank. The main benefit of a thermosiphon system is that it works without a pump and controller. This makes the systems simple, robust and very cost effective. In most thermosiphon systems, the tank is attached to the collector and both are situated on the roof. This solar thermal system is most common in the frost-free climates of Southern Europe. Forced circulation systems: These are most common in Central and Northern Europe and the tank can be installed anywhere as the heat transfer fluid is circulated by a pump. Therefore, integration with other heating systems is easier. The aesthetic benefit of these systems is that the tank does not have to be located on the roof. A forced circulation system will need sensors, a controller and a pump. Collective SDHW for larger buildings: Central water (and space) heating is common in larger buildings. Increasingly, collective solar domestic hot water systems are being installed into multi-family houses, hotels, office buildings etc. These collective systems have a collector surface ranging from ten to several hundred square metres. In Central and Northern Europe, solar thermal systems that provide heat both for domestic hot water and for space heating are commonly installed. These combisystems are often more complex than solar systems supplying DHW only and, as a result, system design must be adapted to the specific requirements of the building. Different practices are used in different countries. In Southern Europe, combisystems are still rarely used, but there is a huge potential for these systems to generate space heating in winter and air-conditioning in summer, as well as DHW throughout the year. Solar district heating (SDH) plants are a very large scale application of the solar thermal technology. These plants are integrated into local district heating networks for both residential and industrial use. During warmer periods they can totally replace other sources, usually fossil fuels, used for heat supply. Thanks to technological developments, it is now also possible to store heat in summer for winter use. Currently there are many plants in operation in Sweden, Denmark, Germany and Austria. Recently, there have been developments in collector technology that allow solar thermal systems to be used in low temperature industrial processes ranging from drying to pasteurisation or sterilisation. There is great potential for this application in the food, beverage and transport equipment sectors. A heat pump is a device that can provide heating, cooling and sanitary hot water for residential, commercial and industrial applications. It transforms the energy from the air (aerothermal), ground (geothermal) and water (hydrothermal) to useful heat. This transformation is done via the refrigerant cycle. Today, more than 7 million heat pumps are running in Europe. Their prevalence is spread unequally across Europe. In Sweden, about 40% of the households are heated by heat pumps. In Germany and the UK, on the other hand, there is still huge untapped potential: Less than 2% of households are equipped with a heat pump. For each kW of electricity consumed by a heat pump, about 4kW of thermal energy is generated. This corresponds to a 300% efficiency (a state-of-the-art condensing gas/oil boiler has an efficiency of 90-96%). About 75% of the energy that is used is renewable, whereas 25% of the energy is generated by other sources (in 99% this is electricity). If the electricity is generated by renewables (PV, wind, hydro), then the heat pump is 100% renewable and CO2-neutral.The European stock of heat pumps in 2013 saved 20.04 million tonnes of CO2 emissions. This is almost the amount of CO2 emitted by Croatia in 2010 (20.9 Mt; source: World Bank). According to IEA, heat pumps could save 50% of the building sector’s CO2 emissions, and 5% of the industrial sector’s. This means that 1.8 billion tonnes of CO2 per year could be saved by heat pumps. The EU imports energy worth over 400 billion euros annually. Heat pumps reduce the use of primary and final energy. With greater uses of heat pumps we would need less energy and by consequence less would need to be imported. This saves costs and secures the supply of energy at the same time: we become more energy independent.